Marie Kondo’s bestselling book demonstrates how to tidy your space. But why not KonMari your writing as well as your house with the same simple principles? Tidying the house is exhausting. It’s physically tiring because of all the running up and down stairs with items which need relocating from room to room. But more than that, it’s mentally exhausting because of all the small KonMari decisions you need to make as you tidy. Keep or toss? Put it with similar items or have a spare set of them in this room as well as that room? Charity shop or recycling? Can I eBay it? Can I please stop now? Writing is also a morass of tiny decisions – every character needs to sit or stand or speak or do nothing, every sentence must have rhythm and sense, every word must mean exactly what you intend, and this all takes place in a setting which you must design in its entirety. Wouldn’t it be great to have a system you could use to declutter your writing in the same way you declutter your house? Wouldn’t it be great to be able to make those editing decisions with confidence, kowing that what is left is exactly what you need and love? 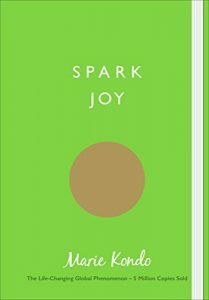 William Morris has a famous saying: “Have nothing in your house that you do not know to be useful, or believe to be beautiful.” Marie Kondo, AKA KonMari, the Japanse tidying guru, believes that you should only possess things which ‘spark joy’ when you touch them. These tenets simplify tidying decisions. If it’s not useful and sparks no joy – it goes. Easy. Using these ideas, my house now contains less junk, less of the things I previously had two or three of, and more free space. Now, if I need to declutter, it’s only a surface layer built up during a busy period – and my task is simpler because I know the rules by which I keep or ditch each item. -What’s the point of this scene? (points to lengthy section detailing a trip to a market square). -It gives local colour of the market in this fantasy town, and shows how I’ve invented amazing foodstuffs for my characters’ breakfast! -OK, so do we learn anything except that there’s a market and my characters have breakfast? -Uh, there’s a bit of gossip they pick up about the Plot. -Right. I can put that in on their way to the Palace. I find these decisions go double for dialogue. If I find a raft of to-and-fro while a character updates another character with what’s happened in the previous chapter – I usually ditch it. I am especially suspicious of relating phone conversations where everyone on this end of the line already knows what’s gone on: dull. If there’s a funny line or two, I cut and paste it into my ‘edited out/keep for next time’ document (see below for more on this.) I have loads of hilarious exchanges between my hero and his friend – but they did not fit with what their scenes needed to achieve. But what about sentimental items, you may wonder – in your house, this might be ornaments given to you by departed loved ones, or memorabilia from a wonderful trip. In writing, these are the beloved scenes which are your absolute favourites, or which inspired the whole story. The FlyLady has a solution for this tidying problem – take a photo of the thing and get rid of it. That way you still ‘have’ it – the ugly vase, the mountain of your children’s’ drawings – but you don’t have to store it. Decision: the great scene in which my hero is obliged to dance with his friend’s abrasive sister, gone. I love that scene. But I’ll find another story where it moves the plot forward for the hero to be blackmailed into a foxtrot. In my own writing, I try to include only things which move the story forward, or are vital for the reader to experience the setting. 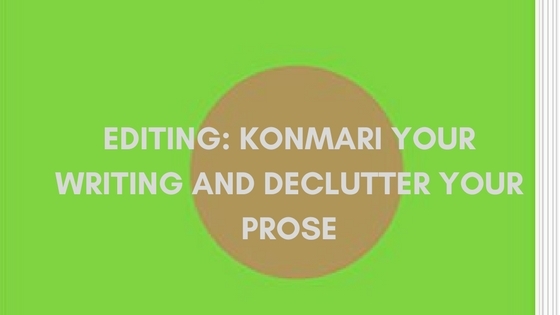 I’ve got more work to do – a lot more work – before my writing is as lean and efficient as it should be – but with these principles beside me, alongside my trusty KonMari book, it is not as exhausting as it seems. How do you tidy your writing? Let me know in the comments. 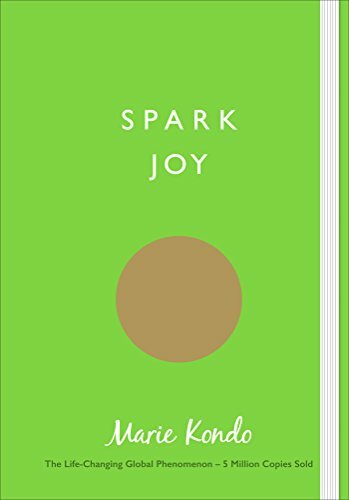 Spark Joy by Marie Kondo the global phenomenon that is KonMari explains her guiding principles for a tidy and beautiful living space. The FlyLady – a system for avoiding chaos in your home and your life. *There is a whole genre of fanfiction known as fluff, which basically requires zero plot and is one hundred percent indulgence of favourite fantasies about your beloved characters – Sherlock and John getting a puppy for Christmas, for example. So plot is unimportant, but the beautiful/useful rule still applies – a chapter without squee is a chapter that wastes the reader’s time). Excellent piece of advice. I can relate the editing to house-cleaning and appreciate both, now that I have read this post. No more complaining.